On Tuesday 6th of September, a group of 14 clients from AMH New Horizons in Antrim came together with dare we say “trepidation” with Belfast based, Spanner in the Works Theatre Company’s, Trisha Downey. Initial comments being bandied about the room were “I’m not acting” and “I just want to help behind the scenes”. However, after five high energy workshops, Trisha had worked her magic and turned 8, initially stage shy, men into budding actors. Collaboratively, the group came up with the idea of adapting some scenes from “One Flew over the Cuckoos Nest”, a 1962 Ken Kesey novel, which was adapted into a five times Academy Award winning film starring Jack Nicholson in 1975 . 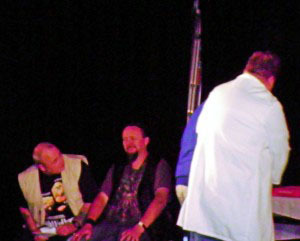 The production was set in an Oregon asylum, and aimed to show the “old face” of mental health services and the dehumanising effects of institutionalisation. 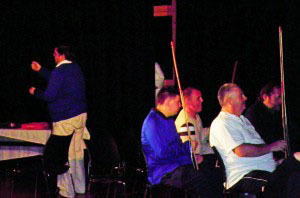 "One Flew Over Lost Horizons"
The purpose of using theatre was to enable participants to explore issues that are relevant to them in a participatory, creative, dramatic and fun way. We also wanted to demonstrate the values of; using drama in learning and development; providing access to the arts for people who may not otherwise have the opportunity; and building confidence and encouraging participants to confidently deal with difficult issues. The Theatre group worked towards the goal of performing the finished production “One Flew Over Lost Horizons”, for World Mental Health Day on Monday 10th October in the newly renovated Old Courthouse Theatre in Antrim. The premiere of the play was attended by 40 people and included family and friends, Northern Trust referral agents and AMH Clients and Staff, including CEO David Babbington. 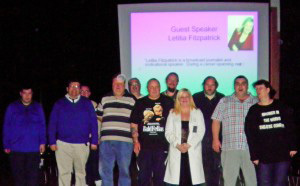 The event was supported by journalist Letitia Fitzpatrick who gave a very open, frank and moving talk on her experiences of mental illness, her admission to a psychiatric ward and the stigma still associated with mental ill health. Her talk was followed by the Theatre Groups 25 minute production which was rewarded with a standing ovation from the audience. A big thank you goes out to Trisha Downey and the Clients for all their hard work. AMH are currently in the process of trying to secure some outside funding to take this group forward as they are keen to do a further production which explores the future for people suffering from mental ill health.